Hello, everyone! Back with another episode of “As the Kitchen Transforms”. Today’s DIY Tuesday Tip is about making templates for your drawers and door hardware installation. 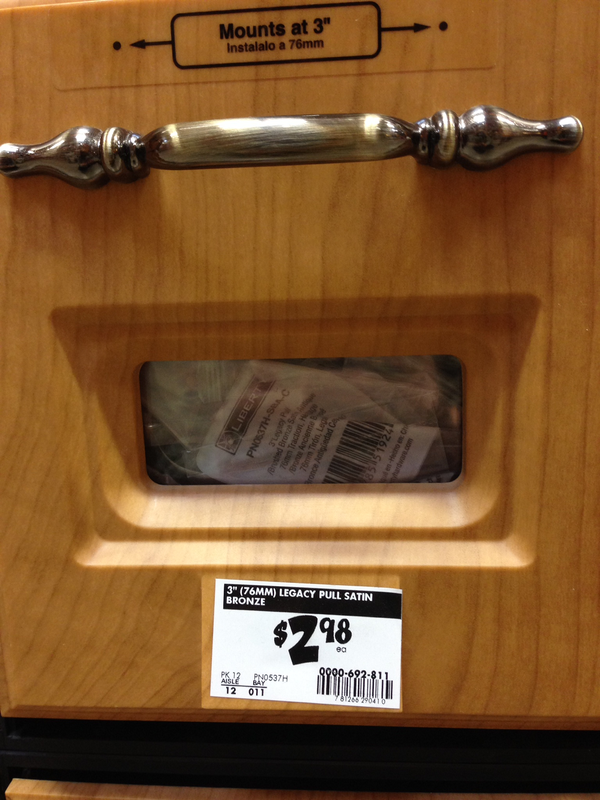 Now, if you have cabinets that already have hardware and you are just replacing or refinishing it, yay for you! In mom’s case, however, there was no hardware, so we had to start from scratch. You know, finding the right hardware isn’t always that simple, especially when you are going for a specific “look”. We did quite a bit of browsing, both online and in the big box stores, searching through all those little bins for just the perfect style and color. 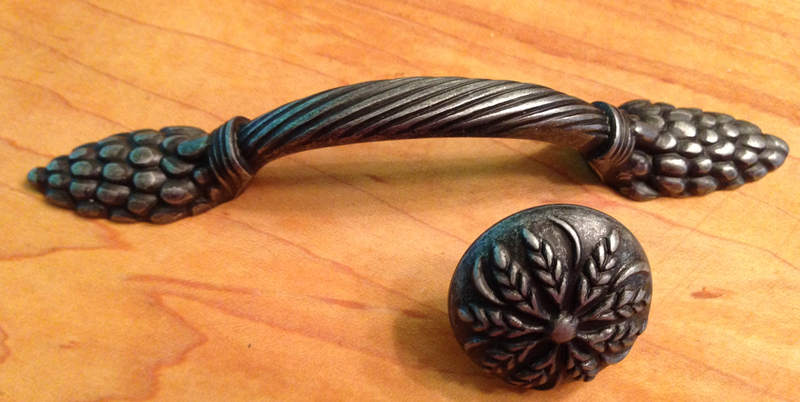 this hardware from Jeffrey Alexander is the perfect style for our French Country Kitchen makeover. 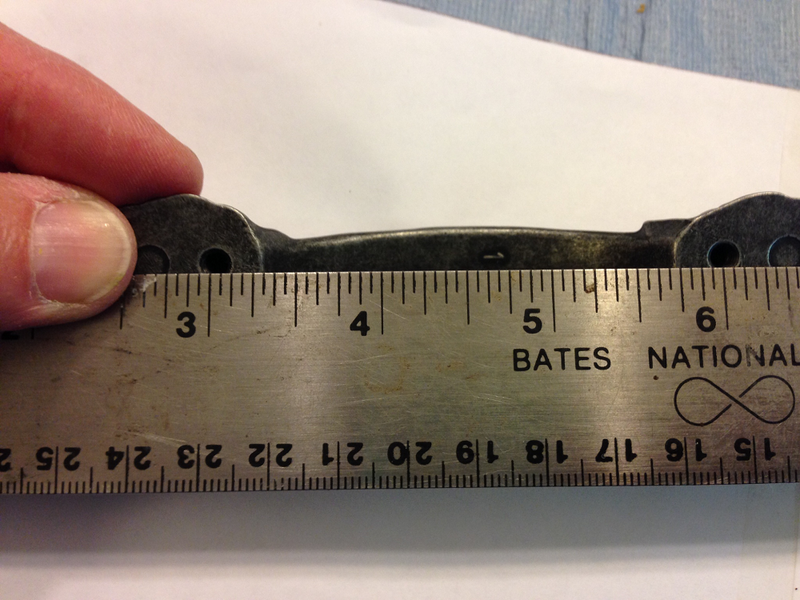 But, and this is a big but, they did not have the matching hinges. Now, the hinges that were already in place were a nice c.1970’s brass, tarnished but in good shape. We decided to spray paint them, rather than purchase all new ones, since they aren’t all that visible anyway. 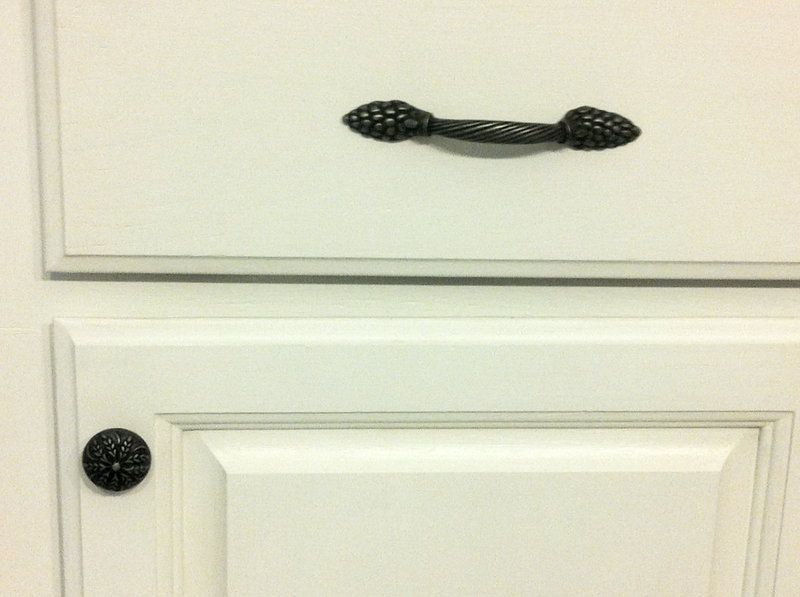 But, since the new hardware was black and silver, the hinges needed to match. I dug out the spray paint I had handy to decide which one would be the closest match. Can you choose which one we chose? and the doors re-hung, in their original drilled holes, with a couple of corrections. 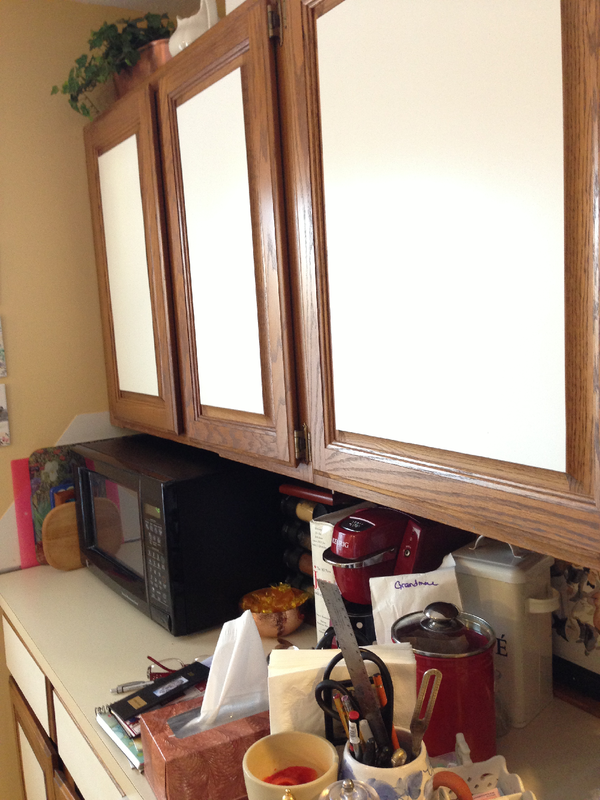 Apparently, when the cabinets were dark brown with no hardware, slightly off-kilter edges were not an issue. 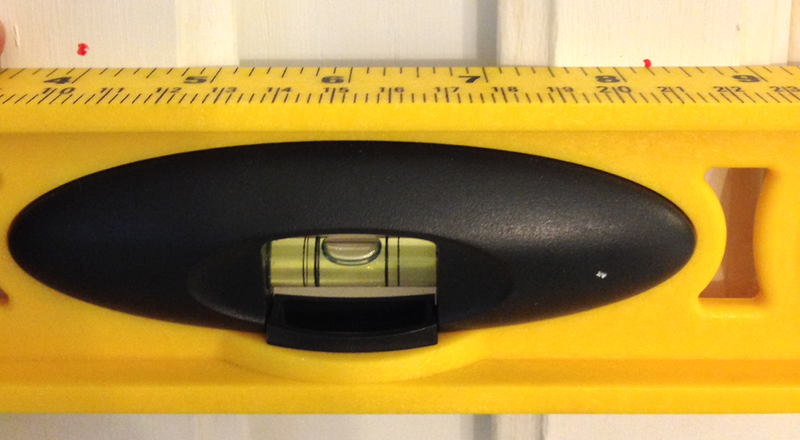 However, the hardware, now a very visible dark gray against a white background, must be level!! 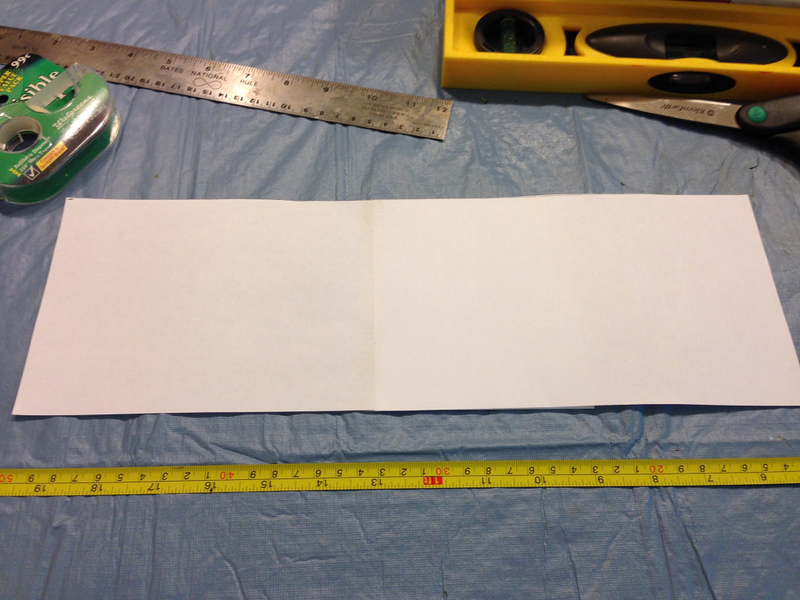 To make that happen, templates and a level are super important Tuesday’s DIY Tip! 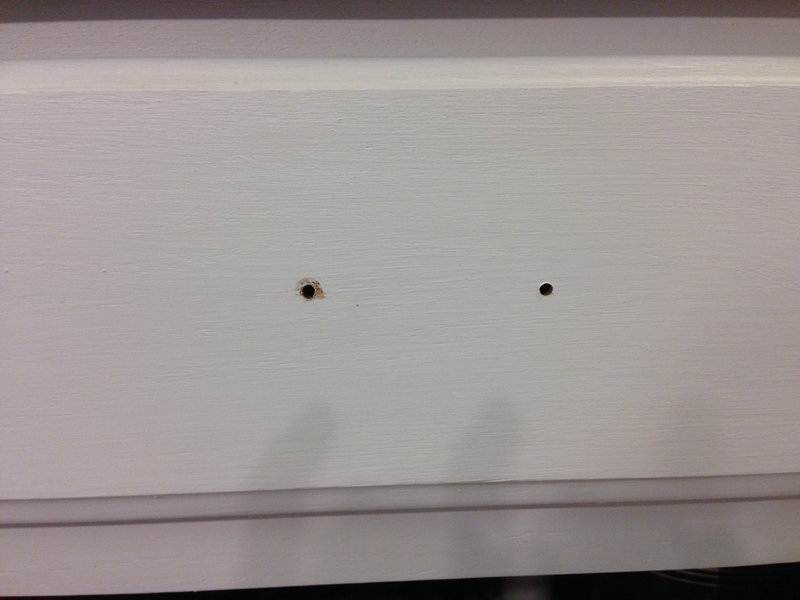 For the drawer pulls, I measured the width of the Center to Center Distance (that is the distance between the two mounting holes), in this case 3 inches. 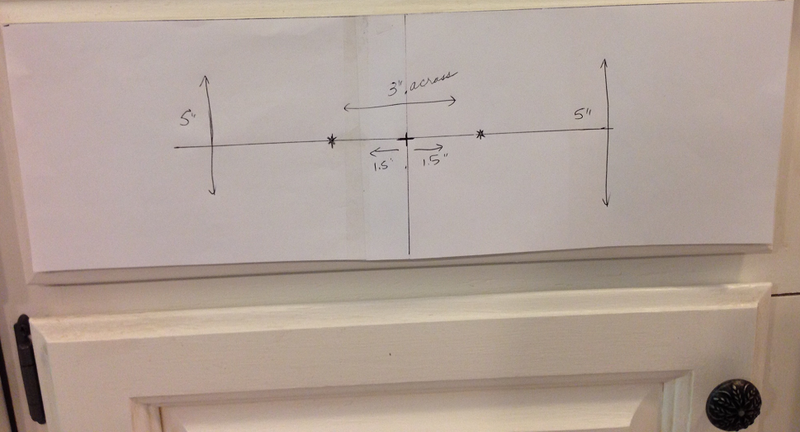 From there, I created a template of the entire drawer face with exact measurements. 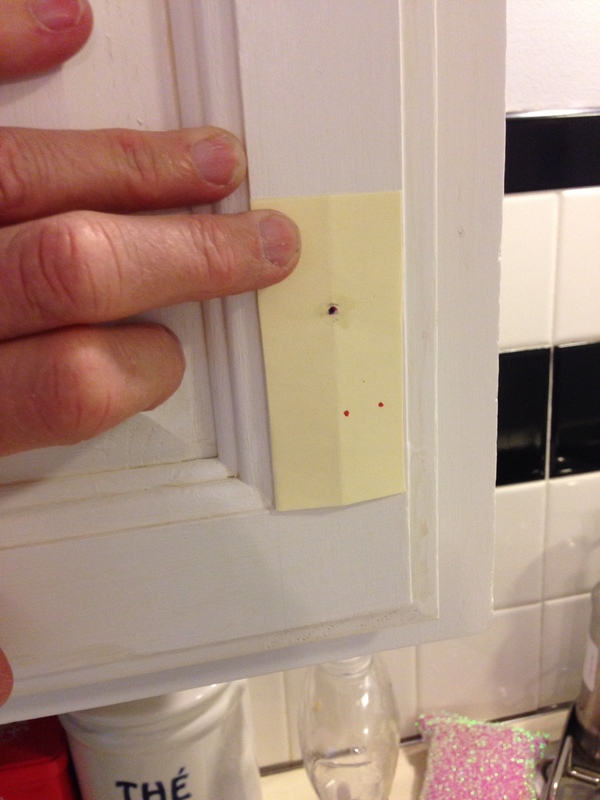 Then I taped the template to the drawer and marked the drill holes. 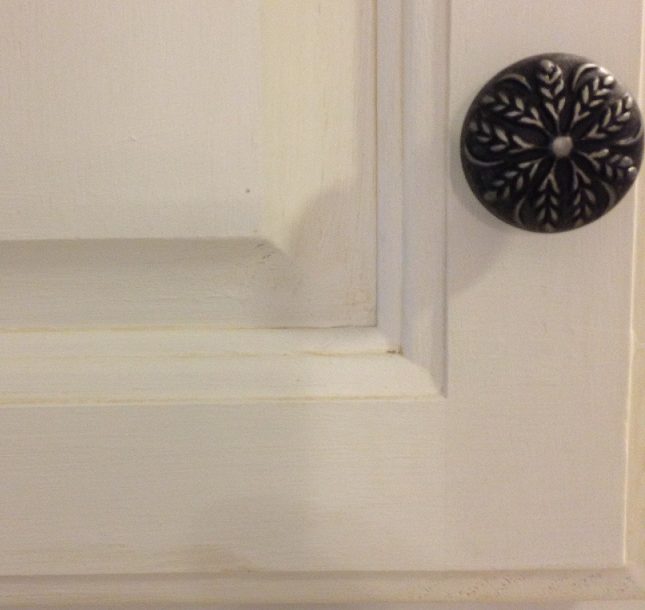 which meant that the knobs, even though they were in the correct position on their respective doors, would appear to be crooked. Disclaimer: I did not install the cabinets originally, so if the doors were slightly off, I’m not taking the hit on that one!! 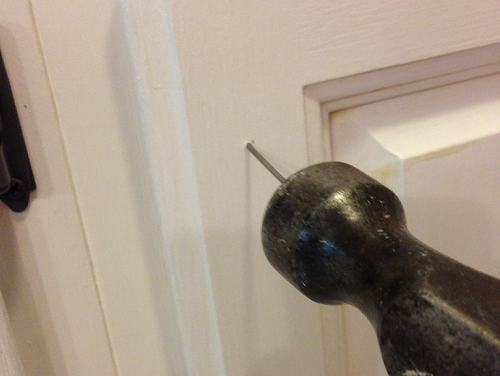 I did actually correct a couple of them, which meant patching and redrilling the holes, then re-installing the hinges. I decided to let the rest go, as long as they weren’t creating a “tilted fun-house” effect and appeared to be pretty even. Which was a little scary at first. 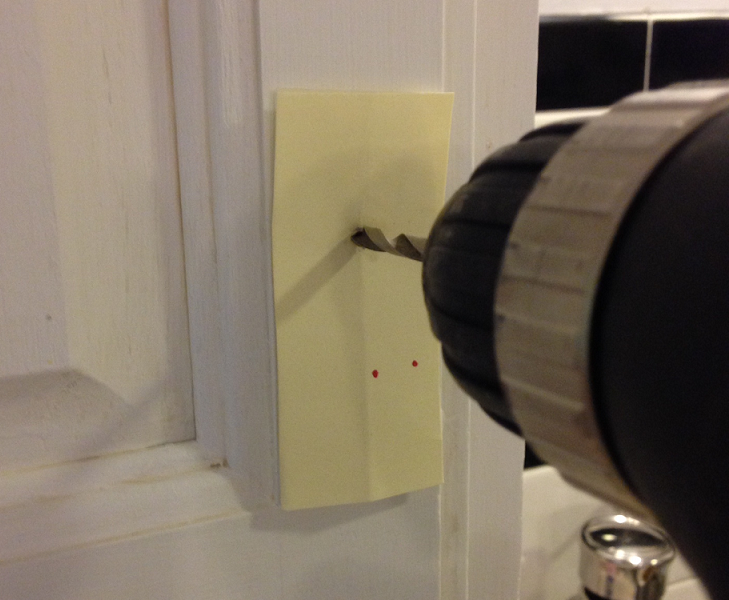 On a shiny surface, the drill bit sometimes “wanders” when you first start it, so after a couple of near misses, I decided to start with a pilot hole to give the bit something to dig in to. 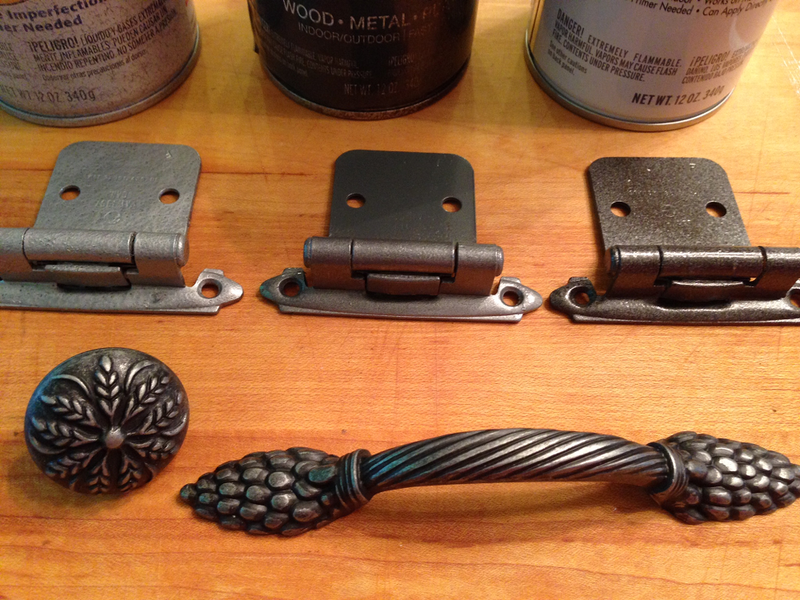 and here they are now, all painted and glazed and waxed with the pretty awesome new hardware. Looks amazing! When we first moved into our 1971 built home, we wanted to update our kitchen on a budget. We replaced the horrible shiny brass handles with a more modern brushed nickel handle, but couldn’t find similar hinges ANYWHERE. And I mean, ANYWHERE. We ended up spray painting them and no one can ever tell. So cheap and so easy! Absolutely Stacey! 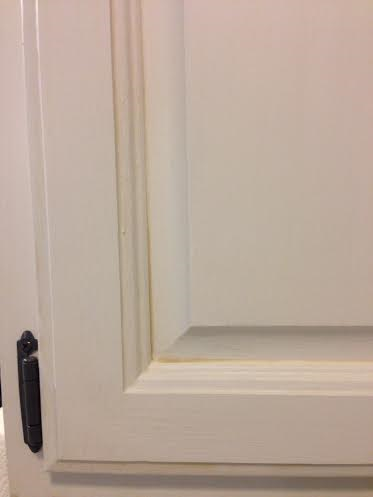 When it’s a piece that is just not very prominent, it only makes sense to paint them and keep the $$$! BTW, did you find the beige you were looking for? So smart and I love the way the cabinets turned out! They look so crisp and happy.